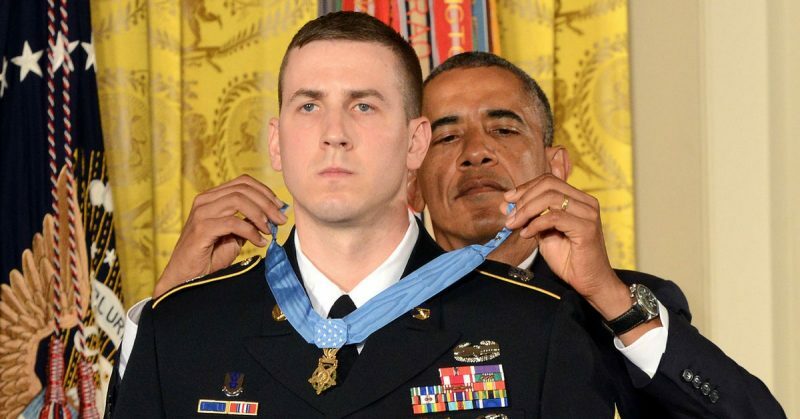 Pitts receiving the Medal of Honor from President Obama. It is often said by the recipients of the nation’s highest military honor that they earned it on what they remember as their worst day. Usually, when such inexplicable acts of gallantry are necessary, friends are dying, the enemy is resilient, and they insist they are just doing their job. Such was the case for Sergeant Ryan Pitts as he served with incredible courage with a small patrol base in the Waygal district of Afghanistan. Assigned to an observation post with eight other paratroopers, Pitts and his men served as the eyes and ears for the 48 man contingent attempting to establish an American presence. Unfortunately for the Americans over 200 Taliban fighters had taken notice. During the early morning hours, they rocked the American position with grenades, RPGs, and small arms fire. For the nine-man OP, the attack was withering. Wounded during the initial wave, Sgt Pitts continued the fight despite overwhelming odds for over an hour. Coming to terms with the fact that he was the last man alive and help was pinned down, he gallantly continued the fight. The Americans were able to hold on to the patrol base but at significant cost. For Pitts, it was his friends that paid the ultimate sacrifice, but in their honor, his gallantry was recognized with the nation’s highest military honor. 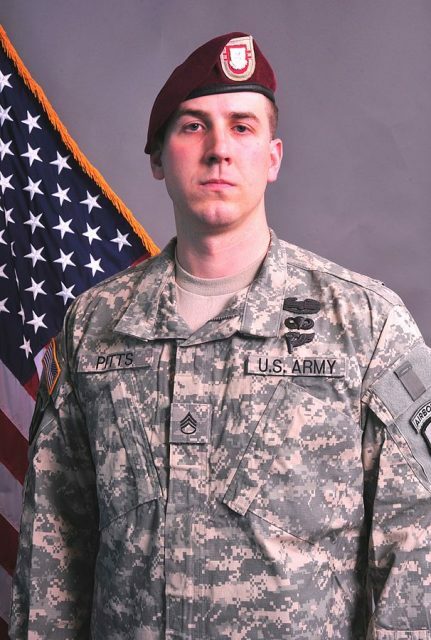 Staff Sergeant Ryan Pitts, April 2014. Ryan M. Pitts was born in 1985 in Massachusetts meaning he came of age just as the US was embroiled in the long war on terrorism. Like many men his age, he decided to enlist in the United States Army and serve what he felt was his duty to his country. Finding his way to the airborne, Pitts was eventually assigned to the 2nd Battalion, 503rd Infantry of the 173rd Airborne Brigade. It took him on a path to Afghanistan in 2008 to the Kunar Province near the village of Wanat. 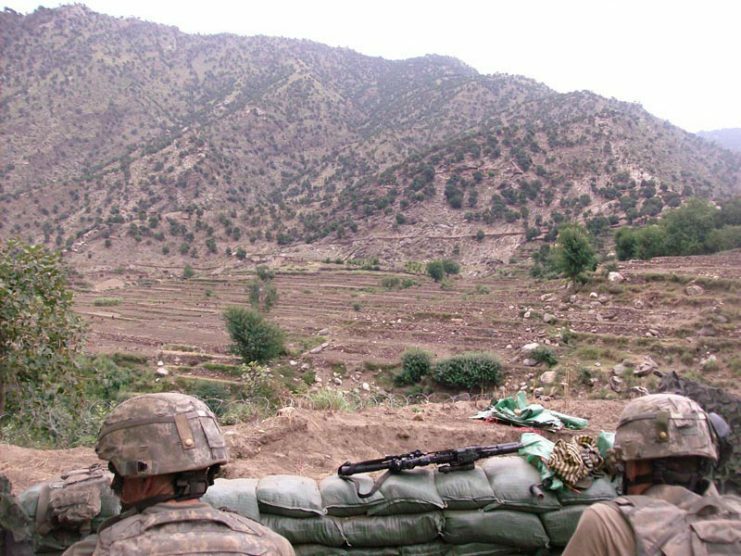 Attempting to establish a presence, US forces arrived on the evening of July 8, 2008. Immediately setting up a patrol base, they reinforced their positions in anticipation of enemy resistance. With a small vehicle patrol base utilizing mounted vehicle weapons, they set up the main base with a forward observation post/listening post stationed on the higher ground. The elevated position became known as OP Topside with the main location dubbed Vehicle Patrol Base Kahler. After less than a week at the position, the morning of July 13 had clear indications that it would be far from a normal day. As Pitts himself reported, typically by pre-dawn villagers were in the fields working before the sun came up. On that particular morning, none could be seen. A vehicle-mounted TOW had recorded several groups of men walking together in what was unlikely to be villagers. Just as the 48 man unit began to organize a patrol to disrupt the activity their morning was interrupted by the less than courteous fire of over 200 Taliban fighters. US Army soldiers man Vehicle Patrol Base (VPB) Kahler near Wanat, Afghanistan on July 12, 2008, the day before being attacked and nearly overrun by 200 Taliban fighters. With warning signs of a pending attack, the men of the OP and patrol base began to prepare their defense. At a little after 0400, those plans were interrupted with a volley of accurate enemy fire. The Taliban had taken up positions in the nearby Hotel, Bazaar, and Mosque along with the surrounding hillsides. Aiming at the OP as a forward target, their firepower landed with devastating effect. Making matters worse, the enemy had taken advantage of canals and shrubs to crawl within grenade-throwing distance. As the grenades began to land, Pitts received wounds from the first volley. Obtaining aid, he was informed that multiple men of his nine-man team had already been killed in the action. Realizing the proximity of the enemy, Pitts began to return grenade fire with the risky tactic of cooking-off grenades. Pulling the pin and releasing the handle he held it for a few seconds ensuring that the enemy would have no chance to avoid the damage. The risky tactic kept the enemy at bay. Grabbing the radio, Pitts embraced his role as observer and began to radio back situation reports to his commander. Directing fire and calling in support he was able to assist continuing to hold at bay the enemy that outnumbered the Americans at 4 to 1 odds. Desperate to support the OP, the commander sent two soldiers through enemy fire to reach it. Once they arrived, they realized the dire situation and began to join the fight. Unfortunately, as they made their gallant stand, Pitts realized he once again failed to hear the sound of returning fire and voices from their position. He was again the only one left alive as he continued to direct fire via the radio. 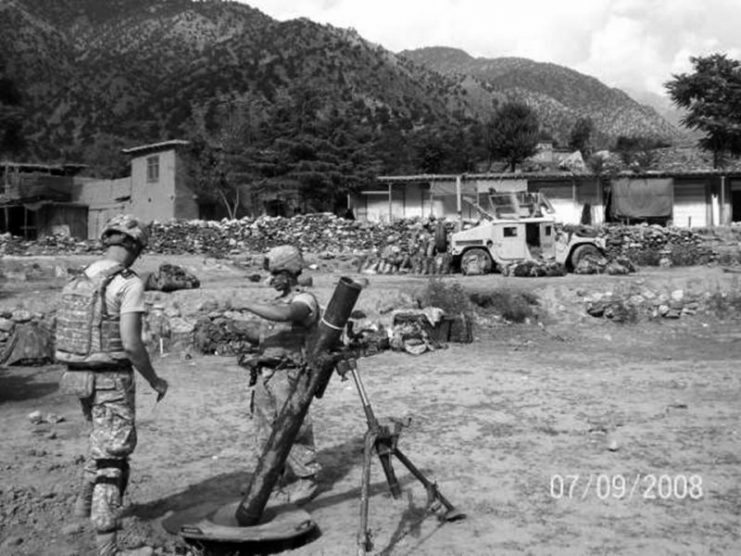 View of Wanat COP looking east from mortar position with 2nd Squad position, the bazaar and OP Topside’s later location in the background, 9 July 2008. The commander informed Pitts there was no one he could send to support the isolated Pitts, a decision Pitts said he fully supported. In Pitts’ own words, he decided it was his time and he was determined to take as many of the enemy with him as possible. Armed with an M203 grenade launcher, he fired directly above his position so that the grenades landed just on the other side of the OP wall. Continuing the fight, he was relieved to hear the sound of friendly attack helicopters overhead and eventually four more soldiers joined his position. Wounded and bleeding, Pitts continued to do his job calling in fire and encouraging his fellow soldiers. Nearly two hours after the battle began appropriate reinforcements arrived, and Pitts made his way to the casualty collection point. For his actions that July morning in 2008 in Afghanistan, Sergeant Ryan Pitts was awarded the Medal of Honor. His thoughts are never far from the men who died beside him that day and in whose name he accepted the nation’s highest military honor. Making his stand until the end, Sgt Pitts displayed the highest ideals of the US Military and faithfully showed the same inexplicable gallantry of those who went before him.